Photo: © Alan Murray-Rust and used under license A low-slung red brick affair that looks at first sight more like an unusually handsome village hall or even the gymnasium of a prosperous public school. On approaching closer, one sees that the stained glass windows give it away as a place of worship – but one would probably guess it to be a nonconformist establishment: Unitarian or Moravian perhaps? In fact it was built as a Church of England church that was from its foundation Anglo-Catholic in its churchmanship. It dates from 1880. The architect was the celebrated Norman Shaw, who worked in the Arts and Crafts style and is better known for designing mansions for nouveau riche industrialists and the headquarters of the London police force: New Scotland Yard – hence the unusual architecture. The interior is a delightful surprise – dark green painted woodwork everywhere with pale pink walls. Various fine Arts and Crafts stained glass windows admit plenty of light. In short, an uplifting space. 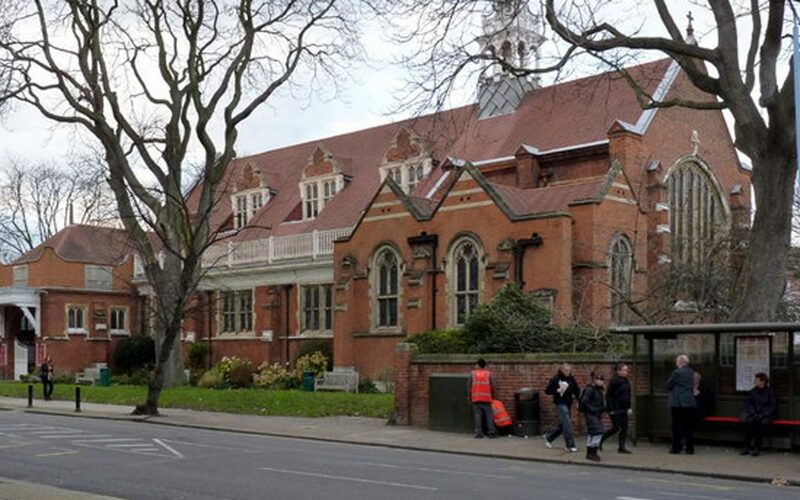 It's just a few steps from Turnham Green Underground station, so in spite of its leafy suburban setting it is well-connected to the wider metropolis. It seems to be a lively parish community, with not only well-attended Sunday services, but also with range of voluntary activities and organizations. They appear to be flourishing, as the parish website and the weekly handout bore testimony. 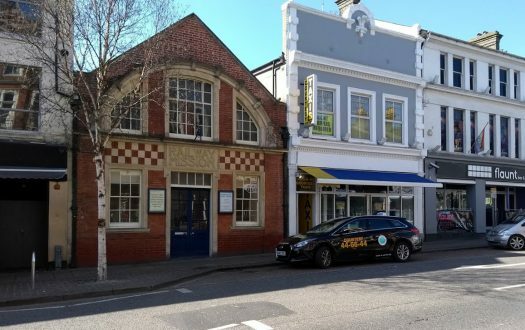 The building is regularly used as a concert venue by other organisations and hosts an annual book festival. It is also a major venue for the Bedford Park Festival. 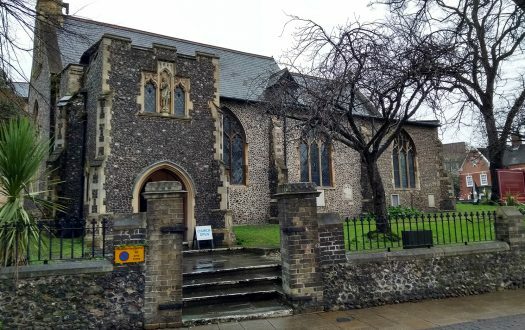 The church was built as part of Bedford Park, a small suburb that self-consciously adopted the principles of the Garden City Movement (self-contained communities surrounded by greenbelts). So there are spacious gardens and many of the houses follow a similar red-brick arts and crafts style of building. The first full garden suburb was in Hampstead, but many see Bedford Park as the first built expression of the ideals of the Garden City Movement, albeit on a much smaller scale. This peculiarly English movement quickly caught on. After decades of genteel benign neglect in the middle of the twentieth century, Bedford Park is today again fashionable and has a good smattering of both architects and television executives among its generally well-heeled denizens. 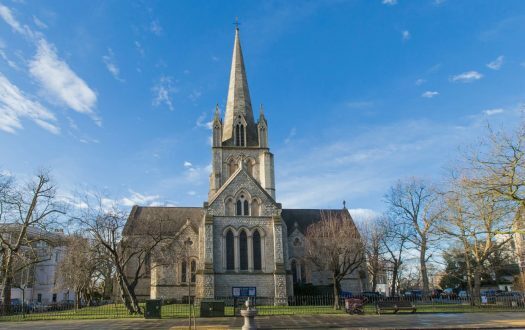 St Michael's is the suburb's church and at the 'gateway' to Bedford Park, opposite a very agreeable large pub. Two assistant priests (the vicar being away), and an altar party of ten. Parish Mass for the feast of Christ the King. Settling down for the start of the service, I lost count at 90. There were quite a few arriving later in the nick of time. Then, after the clergy had processed in, 18 children and young people left us as a group for their own activities next door. So the building was comfortably full. A good spread of ages, probably 70 per cent women. There were greeters armed with hymn books, service sheets, topical flyers about events, and a welcoming smile. This pew suited me just fine. This is bound to be a subjective thing, but I found it to be one of the most comfortable I have sat on in recent memory. There was quite a lot of quiet chatter led by the children and their parents, who were all with us at this stage. We used the New English Hymnal, switching to a separate sheet for the offertory hymn of 'Christ triumphant, ever reigning' (except that I was a bit slow on the uptake and only found the words among the several handouts by the fourth verse). Organ, an almost new specially built instrument located in the chancel. It sounded English, but turns out to be made by Orgelbau St-Martin of Switzerland. There were Remembrance Day poppy decorations still hanging from the chancel screen, around the war memorial and elsewhere too. There were real poppies in the flower arrangements. What also caught my eye were the cut-out human figures placed to look as though they were sitting in the pews (and wearing poppies). I think these ghostly presences, dotted around the church, were part of the Remembrance installation, evoking the members of the parish who had once sat in those pews and who had lost their lives in the First World War. I guess they were intended to distract – they were a very effective and poignant way to recall the losses of war. It was not lost on me either that exactly at the same time we were worshipping, the final document under which the UK leaves the EU and seeks a new dispensation with our European neighbours was being signed in Brussels. Straight up Anglo-Catholic with incense, solemn gospel procession, fine vestments, and communion around a nave altar. The priest wore a biretta and a fiddle-back chasuble, which struck me as slightly ultramontane in this most English of Arts and Crafts interiors. 7 — The preacher was clear, avoided theological jargon, was accessible, and seemed comfortable addressing his flock. During communion a solo boy treble sang ‘Pie Jesu’ from Faure's Requiem. It was a confident, pitch perfect and touching performance, accompanied on the organ. Once or twice the children, who had adjourned to an adjacent parish room for their activities, could be heard. Unfortunately a crescendo in their fun coincided with the prayers of intercession, which were quite difficult to hear as a result. Immediately the altar procession had entered the vestry, lively chatter broke out all round, so that it was quite difficult to enjoy the organ voluntary (William Walton's Crown Imperial). There was a lot of spontaneous socialising and activity. I was about to join in the general outbreak of conviviality when I quickly remembered my Mystery Worshipper duty and looked a bit lost instead. Unfortunately, this didn’t get a response, so I positioned myself to look really lonesome, going on miserable. Unfortunately there was still no response, so I was beginning actually to feel a bit miserable, and left. There was a cheery handshake and farewell from two clergy in the porch as I went on my way. I don’t conclude this is an unfriendly congregation – quite the contrary. But it seemed they were so wrapped up in their existing church friendship networks, chatter and arrangements that they were not looking out for newcomers or the lonely or shy. No coffee was advertised or visible, nor could my nose detect the presence of the bean. Just as I was leaving I saw two people emerge with plastic coffee cups from the room where the children’s activities had been, so that may have been the coffee corner. 6 — If I lived nearer I might be tempted to give it another try, though the unfriendliness after the service gives me pause.